Earthernware, driftwood from a local beach, and buttond selected from Shirley's vintage collection. Measurement is from the top of the wire loop to bottom of fishes tail. 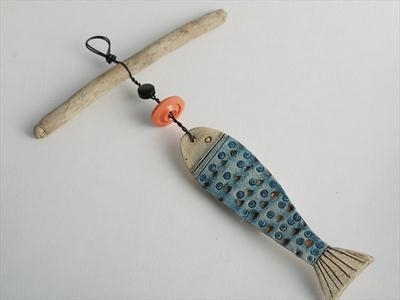 handmade ceramic hanging fish . Made in ceramic, driftwood . Made by Shirley Vauvelle .